This 3 bedroom, 2 bath home is the perfect private hacienda. This is a newer home with elegant Spanish styling throughout. The greatroom floorplan is bright, open and very comfortable. 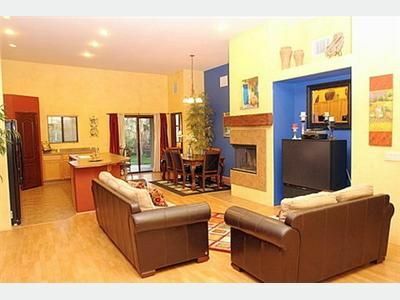 The home has a very nice covered patio that looks out onto a natural desert corridor. There is a patio table for enjoying a sunny lunch as well as a BBQ for grilling and a wonderful waterfall. Inside, the home features a fully equipped kitchen, big screen TV, wood-burning fireplace, and laundry room with full size washer/dryer. The Home is located in an excellent Eastside neighborhood within walking distance to Starbucks, Blockbuster, Safeway, Walgreens, Mamas Pizza, and much more. The home is a short distance from Saguaro National Park and minutes away from Park Place Mall. This beautiful contemporary Spanish style home is a wonderful retreat that we are sure you will enjoy. This a fabulous vacation rental. Don't miss out come enjoy the desert of the Southwest in Tucson, Arizona. We welcome long term guests. Ask us about our extended stay options and rates*.